Councilmember Vanessa Gibson lends a hand installing smoke alarms with Sound the Alarm. Over the last 7 days, the Greater New York Red Cross provided emergency assistance to 635 adults and 175 children following 75 local disasters. Here are some highlights from last week and a preview of upcoming activities (see below). 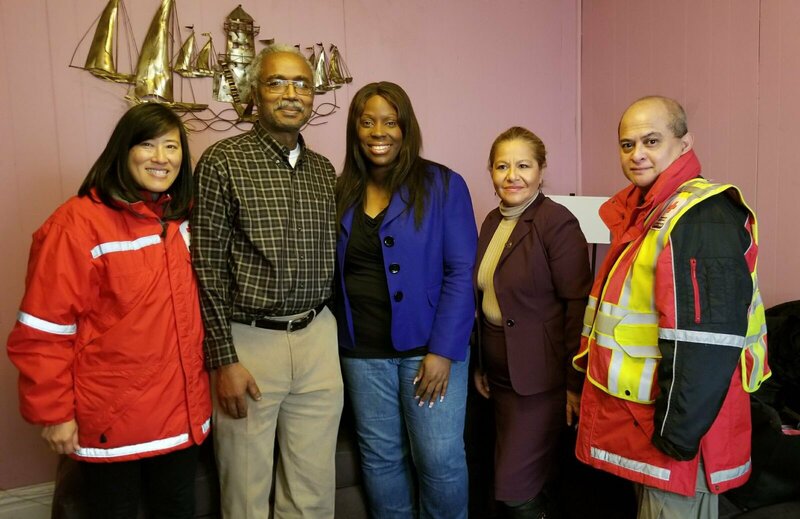 Over the weekend, Red Crossers and partners fanned out across the Bronx (with help from Councilmember Vanessa Gibson) and Amityville (Long Island) to install free smoke alarms to make the community safer. News 12 Bronx reported on the event here. On Sunday, after a fire in Mount Vernon left a multi-generational family homeless, the Red Cross provided them with emergency assistance. Friday saw multiple fires in the Metro NY North region. First there was a fire response in Mamaroneck. Later that morning, an emergency shelter was opened to provide a warm, safe haven for Larchmont residents displaced by another fire. Last Wednesday, we were saddened to learn of the sudden passing of friend and long-time volunteer Carlos Nieves. There is also a GoFundMe page setup in his honor to support his family. On the anniversary of the Haiti Eartquake, we remember the remarkable Stephanie Crispinelli. Her spirit, compassion and dedication to helping others live on through the "Steph Comfort Kits" that are distributed to children who have lost everything to home fires. The week started off with yet another multiple-alarm fire. This time in Washington Heights (as was reported by PIX11 News). The Red Cross opened a reception center to help residents fleeing from the fire and cold. AM New York published a great article: “Red Cross disaster response increases with cold weather” highlighting all the compassion and care our volunteers and staff have been providing for the last two weeks. Jan 16, 19, 22: Red Cross blood drives will take place from 2 to 7 p.m. at the Greater NY Red Cross building located at 520 West 49th Street, Manhattan. Schedule an appointment to donate today. Feb 10: Sound the Alarm. Save a Life. fire prevention event will be in Manhattan. To schedule a future free smoke alarm installation and/or to volunteer to help make your community safer, please visit soundthealarm.org/nyc.